Tablets – just another Groundhog day? The blog post about the ‘Hype cycle‘ from learning4me reminded me on one some topics we covered during my MA study. Terry Mayes used the plot of the film Groundhog Day (German title: Und täglich gruesst das Murmeltier) as a metaphor to describe how the experience of living through the excitement about technology in education always ended the same way – in disappointingly little change. Take Moodle the CMS (Course management system) for example. A couple of years ago Moodle was introduced in vocational schools, advertised as panacea and announced to revolutionise education. Currently just a few teachers adopted Moodle into their teaching and a mismatch between the potential of the CMS and their actual use is visible, insofar as it is used mainly as a repository for worksheets. I can only speak for my previous and my current school I work right now, but I assume that this applies for many more schools. Everett Roger’s invented the ‘Five types of innovators’. Roger’s ‘Diffusion of Innovations’ is a theory that seeks to explain how, why, and at what rate new ideas and technology spread through cultures (Wikipedia). Applying these innovation categories to education I would say that most schools belong to the late majority or even to the laggards. However, according to Geoffrey A. Moore some technologies do not jump the chasm and never find their entry into ‘Main street’ . Sales figures for tablets are increasing and the early majority is already using it, but not necessarily in vocational schools. 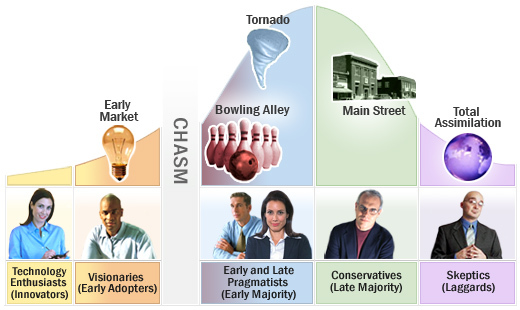 Roger’s five types of innovators and Geoffrey A. Moore chasm theory respectively the ‘Technology Adoption Life Cycle’ shown in the image below from the Chasm Institute. It remains to be seen if tablets find their way into classrooms and more importantly how they will be used. According to the JISC (1) study the main obstacles to successful implementation of innovative elearning practice were insufficient institutional support and lacking attitude from staff, which had doubts whether there would be any benefits. Yet, adequate training and provision of resources (e.g. staff allocated time) greatly helped to reduce staff resistance. (1) JISC (2008) Exploring Tangible Benefits of e-Learning: Does Investment Yield Interest? [online], http://www.jiscinfonet.ac.uk/publications/publications/info/tangible-benefits-publication (Accessed 13 February 2011). « Education – anything but a game?